Arrgg... Some would say the ZX81 has to be the most irritating "toy" micro anyone could own. At the heart of the the machine beats the mighty Z80 processor, similar to the Osborne 1, TRS-80 Model 1 and a few of my other units. However, unlike the latter, that's about ALL there is to this microcomputer. It is minimalist in the extreme! I'm sure the membrane keyboard would have turned many a would-be wiz OFF computers forever. If that didn't, the complex one-press, multifunction key mapping would have! Furthermore, the tiny 1K (yes, 1K!) of RAM meant that trivial functionality was all it was capable of in its unexpanded state. It doesn't even carry an on-off button! Resetting requires disconnection from the power supply. The Sinclair ZX81 though was wildly popular, which is why I have one in my collection. It DOES hold the status of a classic computer. Why, you might ask? it's not particularly cute, although one could argue the beveled shape holds some attraction (it could be used for a doorstop). No, there were two reasons. When released in 1981, superseding the older ZX80 (which could be purchased in kit form), this little unit was the most inexpensive thing around that dared call itself a microcomputer. Although it couldn't do much, what it COULD do was astonishing given the cost and size. It was a triumph of design from Sinclair Research. It also came with a comprehensive and user-friendly manual (seen in the photo). The micro pictured above works just fine. It arrived with its own 16K-RAMPACK expansion unit, which plugs into the card edge at the back. That connection can be temperamental, sometimes rebooting the machine if the keyboard is pressed too vigourously. I've cleaned the contacts with a special gel and that seems to have improved matters. I've got two 16k games and a database program for the unit. How anyone could be patient enough to type records in on that keyboard (being careful not to wobble it too much so the RAMPACK doesn't reboot the machine) then save their data on cassette is beyond me! 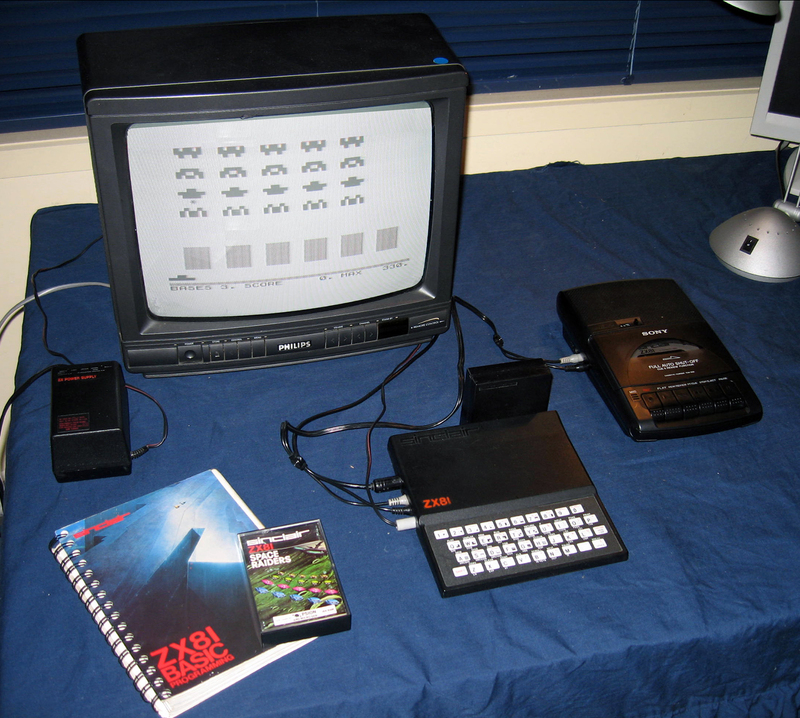 Anyway, love it or loath it, the ZX81's place in history is unquestioned. That's why I've got one. In fact, you can even find support forums still devoted to it. Check out Sinclair ZX World!